We are often asked whether winter is a quiet time for us. The answer is not at all, as garden designers much of our work is spent in front of the drawing board or computer designing plans and drafting lists of plants or writing building specifications and this carries on regardless of the season. Also, each garden usually takes months or even years to be completed by the time clients have reflected, contractors have quoted, then been chosen and booked, plants have been sourced and so on. Even now we are doing site visits – to a snowy, windswept garden where trees and hedges are being put in – this is the time for planting hedges and bare-rooted or root-balled trees. It’s rather exciting imagining how the space will be transformed when these twiggy outlines shoot leaves and turn into comforting green masses. Soon we are off to site some large yew topiary we have brought in from Holland – to go outside a grand country house – of that more next week. A chalked up board “Who said winter is dull?” greeted me on my arrival at Hardy’s Garden Plants yesterday. I’d travelled some distance to visit this Chelsea Gold Medal-winning hellebore nursery and, up to this moment, the early morning journey had been misty, murky and frankly… dull. I’d come here on a mission to find the rare and the most beautiful forms for one helleva-hellebore-mad client, whose garden we completed in the summer. It didn’t take long to see their argument – a beautiful, long border of Galanthus ‘Sam Arnott’, Iris reticulata ‘Purple Gem’ and aconites under Lonicera fragrantissima, Cornus (lime stemmed) and elegantly trained fruit trees. So simple, yet so cheerful and welcoming. 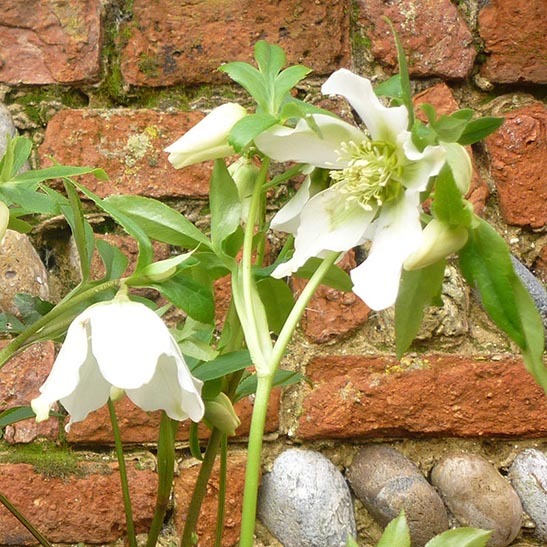 The welcome continued with the arrival of smiling Catherine, laden with pots of hellebores reserved for us. I selected lots of three different clear colours, including all the available and especially breathtaking, ‘white Bradfield hybrid star’ forms. For the same client, we also ordered 2000 Galanthus nivalis ‘in the green’. The view from their kitchen in winter will never be dull again! On Saturday I whizzed in to the local florist in search of tulips. I just love them – instant reminders of cherished Dutch relatives, and also that long, warm days are on their way. The shop owner was busy unloading and checking flowers, buckets of them and ALL red roses. He muttered that they had cost him 250% more than usual for the coming week alone leading to St. Valentine’s Day. As it happens, very few of our clients like red roses. And of course, the one or two that do would certainly not be able to offer their adored ones even a stem from their garden on St. Valentine’s Day. With our extensive plant knowledge, we make sure that every client can proffer their beloved gorgeous flowers from their gardens any day of the year. 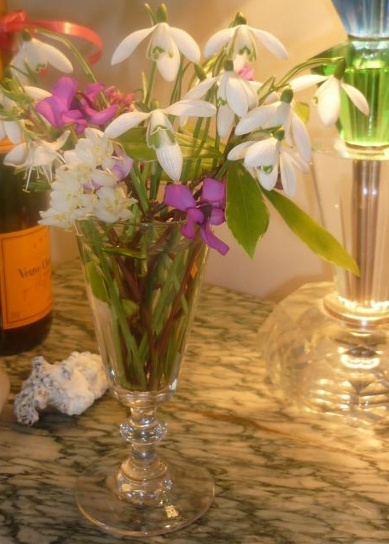 On St. Valentine’s Day, they could pick heady-scented daphne, winter box or honeysuckle and make posies of snowdrops, aconites, winter iris and cyclamens…. Any of these winter jewels presented in an old crystal glass (available from our shop) is guaranteed to melt anyone’s heart, especially with a big kiss! PS – I did find some lovely tulips….. red was the only choice! A beautiful wreath is, like a Christmas tree, a wonderful reminder of how magical Christmas can be. 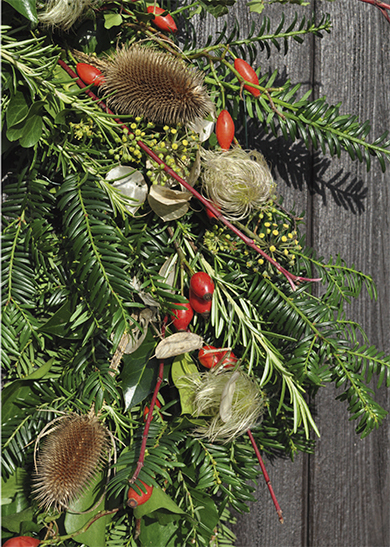 Our favourite types of wreaths are those that are handmade, using all-natural, all-local, native foliage, twigs, berries and seedheads. Even on the darkest days of the year, there are rich wreath pickings to be found in most gardens and if necessary, supplemented by a visit to a local market. We recommend starting with a background of quintessentially Christmas, native evergreens including glossy, berried holly and ivy and also yew. These plant cuttings should be tied on to a round framework (we use long, supple rose shoots, but coat hangers also work) with thin green wire (available from all hardware shops). Adorned with a red ribbon the wreath might be simple and lovely enough. The full arcticle appears in this months edition of Suffolk Norfolk Life.